Judæo-Spanish poet of the eleventh century; probably born at Cordova; died between 1045 and 1055. Ibn Janaḥ, in his "Luma'" (p. 152="Riḳmah," p. 86; between 1050 and 1055), speaks of Joseph as already dead. He saw him at Saragossa, whither he had gone from Cordova. It appears, however, from Joseph's poem that he was alive in 1045. There is therefore little ground for Luzzatto's supposition ("Notice sur Ḥasdai ben Isaac," p. 60) that Joseph was the son of Ḥasdai b. Isaac ha-Levi, who in 960 was an old man. Only one poem of Joseph's has been preserved, the "Yetomah" (Arabic, "Yatimah" ["unequaled"]), it is a panegyric of Samuel Nagdela and his son Joseph, the latter being at that time a boy between ten and fifteen. The beauty of this poem is equal to its name, and critics recognize it as comparable to those of Ibn Gabirol. It is praised by Moses ibn Ezra in a poem published in "Oẓar Neḥmad" (iii. 44 et seq. ), and by Al-Ḥarizi ("Taḥkemoni," ch. iii.). 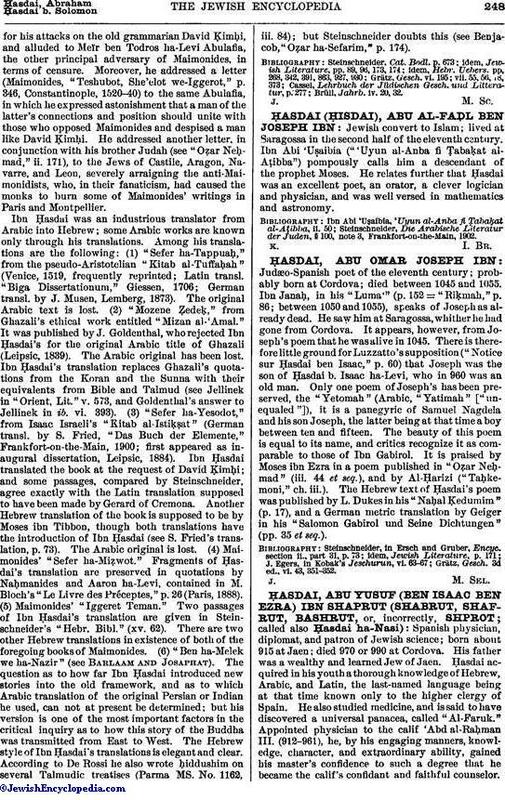 The Hebrew text of Ḥasdai's poem was published by L. Dukes in his "Naḥal Ẓedumim" (p. 17), and a German metric translation by Geiger in his "Salomon Gabirol und Seine Dichtungen" (pp. 35 et seq.). Grätz, Gesch. 3d ed., vi. 43, 351-352.